Last year, the Darling Ducklings Sales Team was a force to be reckoned with. This group of 33 athletes, led by Special Olympics Illinois staff member Leona Brescher, sold almost 6,500 ducks which far exceeded their goal of 5,000 ducks. Their teamwork and dedication helped them raise $32,000 for the Windy City Rubber Ducky Derby which benefits Special Olympics Illinois. This year, they’ve upped their goal to 7,000 and their newest team member, Nick Lorenz, is certainly doing what he can to help them succeed! Each member of the team was charged with selling 50 duck adoptions each. Currently, Nick is the top salesperson for the Darling Ducklings with more than 600 ducks sold! In addition to his expert sales efforts, he competes in several sports including bocce, basketball, aquatics and bowling. And, Nick recently became a Global Messenger and is excited to spread the word about Special Olympics to the community. Right on Nick’s heels is last year’s top seller and this year’s Duck Ambassador, Ela Stoklosa! Last year, her initiative was unparalleled. She convinced her family that the needed to send one duck shaped cookie as a thank you for each dollar raised. When they agreed to it, they probably didn’t realize how hard Ela was going to hit the pavement. Ela and her family baked, frosted, packed and delivered more than 1,000 cookies to donors. Ela has been competing with Special Olympics Illinois in volleyball, basketball, cross-country skiing, floor hockey and athletics since 2008. In addition to competing, Ela is a Global Messenger and speaks to groups about how Special Olympics has impacted her life. Join in Nick and Ela’s fundraising efforts by starting a Sales Team or adopting a duck. Duck adoptions start at $5 per duck. 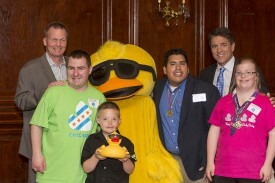 More information on the Windy City Rubber Ducky Derby, sales teams or duck adoptions. The Windy City Rubber Ducky Derby takes place on Aug. 7 beginning at 10 a.m. at 400 N. Michigan Ave. in Chicago. Admission is free and there is plenty of family fun planned including visits from Chicago’s favorite sports mascots and the Radio Disney Road Crew. Duck adoptions will be sold until 12:30 p.m. and splashdown is at 1 p.m.!